The Demise of Circa 2016 – WHAT? Greetings to all. Although I have not done a blog for a while I have been busy (I guess you could call it that). First of all I am so very excited for our country with the election of Donald John Trump. May God bless him and his family and keep them safe throughout his term. God Bless America and all of the Deplorable individuals who were in the basket with me! 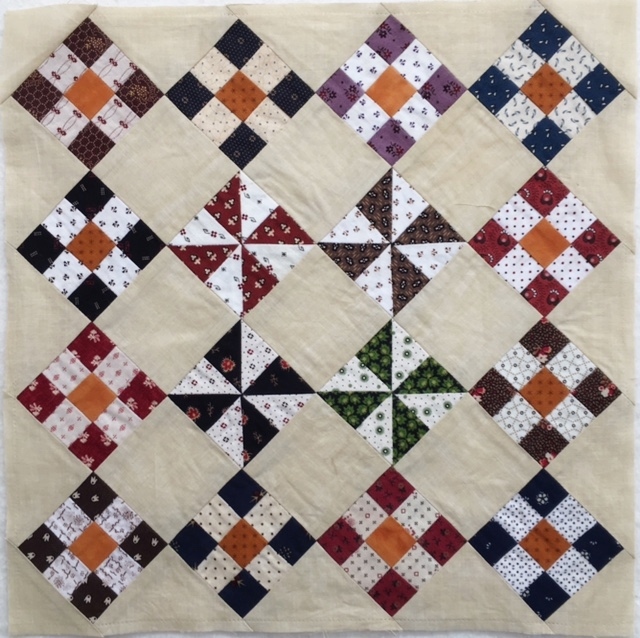 I loved making the blocks for this quilt. Here are a few pictures showing how I put it together. (Some of the pictures are not the best, but you will get the idea as you go forward). 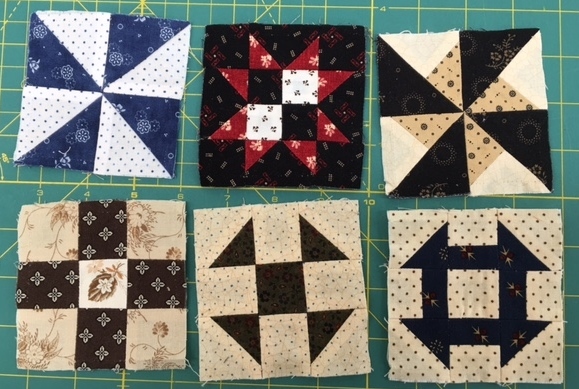 But WAIT – After sending the pictures to my dear buddy Wanda (who also has an eagle eye) sent me a text and told me to really look at 2 of the blocks – Can you guess which ones? I knew that it had to be corrected because I had not paid attention to color placement! Then I realized that on the bottom right there was a problem with puckering – made my day!!! So back to the thing I love most – RIPPING. 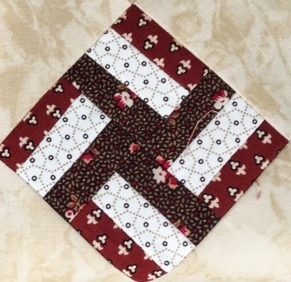 Yes, I could not let the blocks stay in the quilt as it was a harmless error in color placement. They looked great when they were not on point (at least I did not catch the problem then). 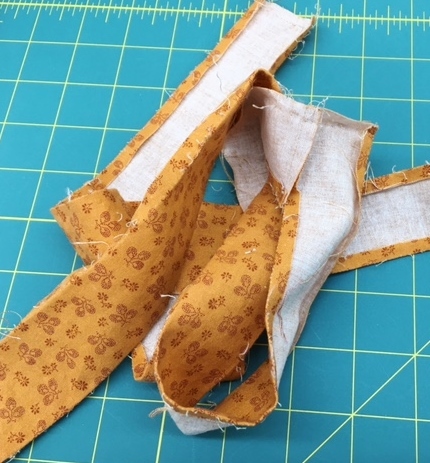 Then I realized that I had another problem – Fabric just does not “ease” in for me!!!!! Now the quilt was beginning to take on a life of its own with nothing but problems for me (caused by me). OK so now I have removed 2 blocks and tried to get the puckering out of the bottom left. Then I began to realize that there was an issue with the very center medallion…..You had to be up close and personal to see it. OK – On the Road Again – Corrections Made! 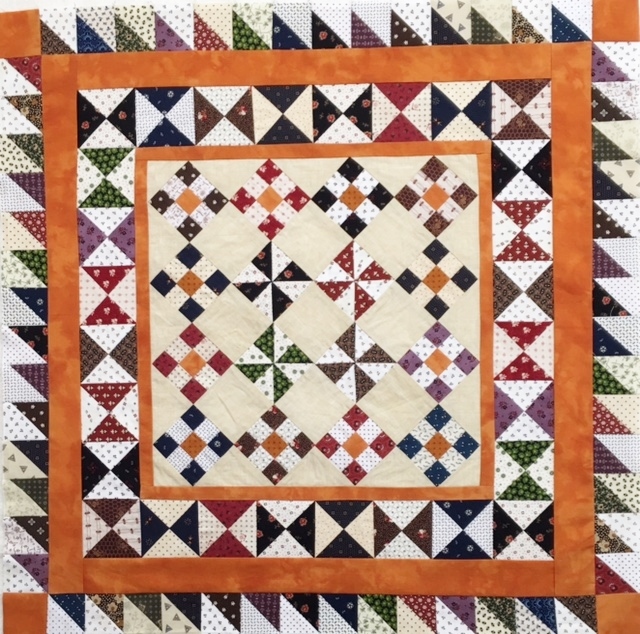 Not so fast – the pattern called for 1 1/2″ HST border. This is where I realized that my quilt was not SQUARE! And it mattered – BIG LEAGUE (good saying). Here is a picture of what happened next and yes – I ended up ripping the entire quilt apart knowing that this quilt was headed to the trash, or the “never-never-never” drawer. I figured the problem existed in putting all the squares together on point – SOMEWHERE! What the Heck Happened to My Quilt? The Joke – I thought the problem was the 2nd border fabric! Being the Type A that I am I was not going to let this quilt beat me – although I had ripped out the entire quilt which took more time than I wanted to devote to the project and maybe some STRESS. So I decided to make up my own pattern. 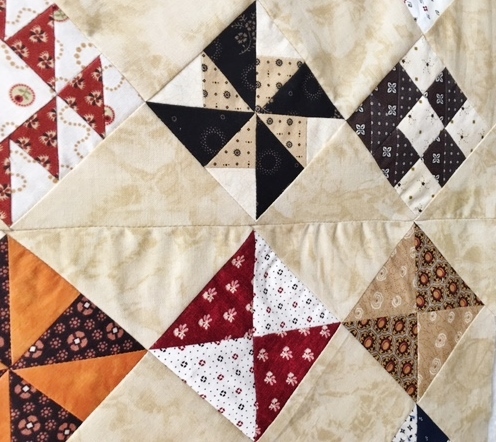 One thing was to put the 1 1/2″ HSTs as the border after the hourglass blocks and go from there. BUT – if you will look closely at the top left of the remake of the Medallion – you will see there was another PROBLEM that would make me re-think everything about Circa 2016! I studied it and tried to see what I had done wrong. Bottom line? The problem started when I put the Medallion together back in April or May. The Antique Muslin (Moda) fabric for some reason (probably the black cat theory) was stretching and it caused me issues that are not correctable! See all the nice wrinkles? Additionally, I went back to the pattern, called the quilt store that put the pattern out, and my final analysis is that I was doomed from the beginning. My next action is to rip out the blocks and put them in the “never-never-never” drawer or the more I write about this mess I am sure that someone will receive the blocks or the trash can will be full this next Friday! Either way, I have decided that I am done with Circa 2016 and as happy as I am with the election I am DEFINITELY not pleased with my quilting endeavors this year. What a mess! OK – you may ask – what lessons have I learned this year (again). NO MORE ON LINE FREE PATTERNS! I must not forget my own rules because as soon as I do I end up in a mess. 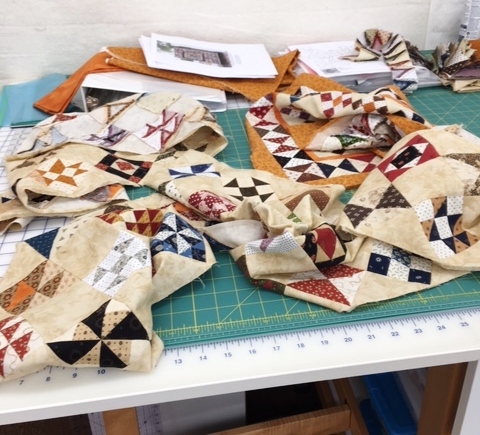 I really did like my quilt, but it would not be worth my time to remake it because when you rip out quilts with 1 1/2″, 2 1/4″ and 1 1/2″ blocks your fabric will not hold up and it is just insane to continue repeating something and ultimately end up with the same bad results – No MATTER WHAT. I feel that there is an issue in the fact that the blocks finished at 2 1/4″ rather than 2″. Most of problems I have experienced this year in my quilts are designer flaws, but then I must take the credit for NOT reading the patterns close enough or making a test block before starting. I do believe that my mind was elsewhere! So my 2017 Resolution is to never have a year like this one AGAIN! Anyone interested in the blocks can send me an email and the first one I receive will get all the blocks – free shipping! Well, there have been many times this year that I was ready to just sell all of my beautiful fabric, all of my lovely patterns, and books and get my knitting out and the rocking chair and become an old woman! But alas, blogging makes the world go ’round and such a great way to make fun of one’s self in life’s little boo boo’s! New and difficult quilting projects provides me the challenge I need to continue on with my passion. I have now prepped the 3 blocks for Ms Potts (3 months behind on that project) and working on prepping the next 5 blocks for Bountiful Life. I am almost finished with Block 6 and hopefully can be through with that one in a few days. I am now thinking of 2017. It has to be a better year for me because 2016 was the worst year in producing quilts than when I started quilting in early 2000. It is time for me to start working on more complex quilts to enter into quilt shows. I need that challenge of making a quilt for show that requires precision and 100% accuracy! I have ordered some Kaffe Fasett fat quarter bundles for my Sweet Surrender. I wonder if this was a mistake as I originally thought I would use my 1930’s fabric (remember the Farmer’s Wife pattern that never got off the ground?). I am beginning to look ahead and thinking that I will delve into my Australian quilt patterns and work on them next year. But I must finish up Stonefields and my Brinton Hall and continue on with Bountiful Life. I pray that each and every one of you have a blessed Thanksgiving and enjoy your family – we have so much to be thankful for this year! Halloween Mini-Shop Hop and Turning Older! Happy belated Halloween. Everyone celebrates this day and it just so happens that it was my Birthday! This year for my birthday I wanted to do a mini shop hop since I missed the McKinney quilt store. My plan was to go visit the Blanco Textile Store ** in Blanco, Texas; One Quilt Place in Fredericksburg, Texas, and Creations in Kerrville, Texas. All of the shops are located in the Texas Hill Country. I have been to Creations numerous times, but not the other two shops. Of course, I meant to take pictures of the shops and fabrics, but duh…. just having too much fun! ** Sorry but for some reason I cannot hyperlink to the Store – If interested, just google the Blanco Textile Store in Blanco Texas! I did not find any fabric that I needed at the Blanco Store. They have some great fabrics, but I was on the hunt for Civil War fabrics. I hit pay dirt in Fredericksburg at One Quilt Place. They have a fabulous selection of Civil War. After the Austin Quilt Show in September Jan and I visited the B&B Quilt Store in Buda, Texas. At the Austin Show I purchased a few pieces for Rowdy Flats and some more stash building to go with the black and white toille from Material Girls Fabrics located in San Angelo, Texas. When I arrived home I received my birthday care box from Jaydee and what a great birthday gift she sent me. Two great books, a Chicken Block, some coordinating fabric, and 2 Marti Michell Log Cabin Rulers! What a wonderful gift from a very dear friend. One Quilt Place has a very large selections of fabrics from the Reproductions to Civil War, Batiks, and others. This was a first time visit and I really enjoyed it. Creations is well known for having almost any fabric you would want. From a very large selection of batiks to a ton of Kaffe Fasset and Civil War. It is such a fun store to visit just as One Quilt Place. Be sure to check out Material Girls Fabrics on-line. I always enjoy talking with Kristina whenever she is at one of the local quilt shows. She specializes in Reproductions, Toilles, and other goodies. Very pleasant and wonderful customer service from all. This was the best birthday I have ever had. A big thank you to Clay for suggesting that we do this on my birthday when the McKinney quilt store fiasco happened last month. I know that he enjoyed the day as much as I did and I loved shopping and looking at all the new fabrics. 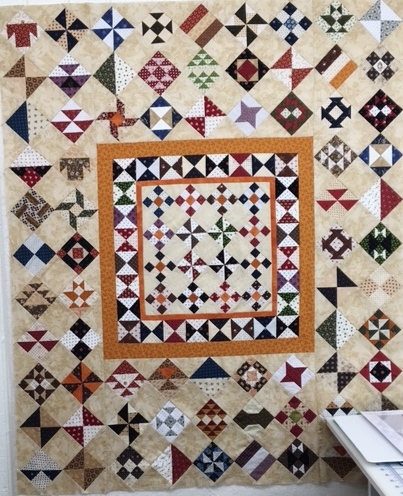 I have been working on my Circa 2016 quilt and plan on putting more of the blocks together today. 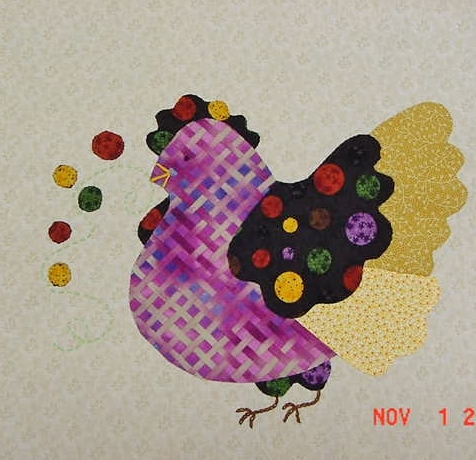 I am hoping to start working on quilting the backlog of quilts that are hanging in my Studio. 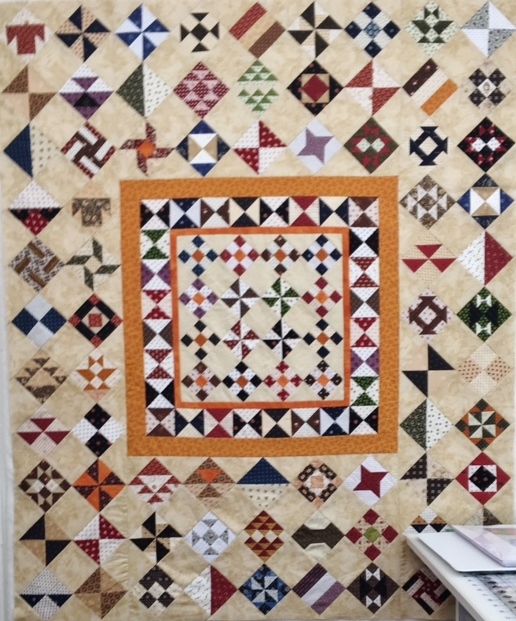 I would love to hand quilt my Circa 2016 and show it next year in the San Antonio Quilt Show. Thursday I will finally get my RF back treatments (they cauterize nerve bundles that stop sciatica pain) and will be back to my regular schedule and no more pain for another 6 months! Saturday I will start my walking routine and finish Circa 2016. It is so tempting to move to other projects, but I am determined to finish this quilt and get some more quilted!!! I am going to work on my hand applique while recuperating and of course watch the political happenings. Better than a movie (LOL).